Prepare your grill for hot, direct heat. 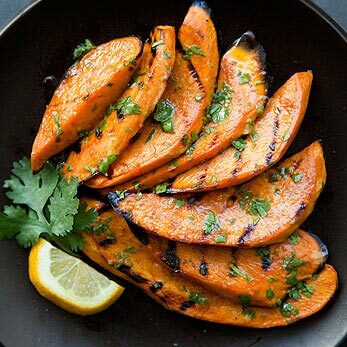 While the grill is heating up, peel the sweet potatoes and slice lengthwise, or on a diagonal, into 1/4 inch-thick pieces. Coat the sweet potato slices with olive oil and lightly sprinkle with Kosher salt. Combine all of the dressing ingredients into a small bowl. Once the grill is hot, lay the sweet potato pieces down onto the grill grates. Cover the grill and cook until each side gets some grill marks, between 3-6 minutes for each side, depending on how hot your grill is. Toss the sweet potatoes in a bowl with the dressing and serve hot.